Women in the Arts and Media Coalition: WomenArts: SWAN Day Pittsburgh Soars Tonight! SWAN Day Pittsburgh Soars Tonight! Some people love Pittsburgh for its football team, but women artists love it for its spectacular SWAN Days. Led by the intrepid Don DiGiulio and Tressa Glover of the No Name Players, the Pittsburgh Super SWANs will soar again tonight, Saturday, March 14 at 8PM at The Twentieth Century Club, 4201 Bigelow Boulevard, Pittsburgh, PA. Tickets can be purchased on Showclix - $25 advance/$30 at the door/$10 students. Now in its seventh year, SWAN Day Pittsburgh is unique because it always features world premiere works created especially for the event by some of the best local artists. The scope is truly impressive. They have presented over 200 women artists over the past six years, and it has been a very diverse mix of musicians, dancers, theatre artists, filmmakers, visual artists, fire-eaters, live painters, and more. DiGiulio and Glover give the artists some kind of prompt every year. In previous years, they have taped interviews with local women, and then asked the artists to create short works based on the interviews. This year, they have given artists the prompt, "Everyone has an untold story behind closed doors. Try to understand that people are not always as they first seem." Tonight they will present an evening of all the performance pieces that have been created this year accompanied by visual art displays in the lobby of the theater. There will be some new faces this year, as well as returning favorites such as the singing duo, Camelia Road; the multi-cultural contemporary dance company,Reed Dance; singer-songwriter, Bridgette Perdue; photographer & film producer, Kahmeela Adams; and painter, Tiara Dinkins. Other artists participating this year include: Brooke Annibale, Judith Avers, Jackie Baker, Laura Barletta, David Bielewicz, Bodiography Contemporary Ballet, Jennifer Buck, Bridget Carey, Siovhan Christensen, Angela Citrola, Continuum Dance Theater, Ashley Cornwall, Kaylyn Farneth, Eve Goodman, Jessica Heberle, Mils James, Jen Krezezcowski, Everett Lowe, Aimee Manion, Jena Oberg, Jody O'Donnell, Gayle Pazerski, Tracey Ramun, Rachna Rajen, Sherri Roberts, Danielle Rode, Elizabeth L. Ruelas, Texture Contemporary Ballet, Bria Walker, and Students from Act One Theatre School and Pittsburgh CAPA. Congratulations to everyone on the SWAN Day Pittsburgh team for another great year! Show Us Your Best SWAN Salutes! 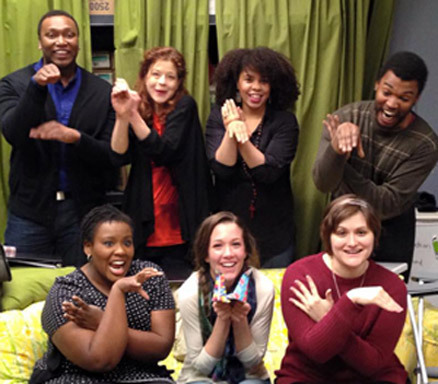 Fierce Pittsburgh artists warm up for their show by doing the SWAN Salute! If you have a great picture of you or your group doing the SWAN Salute, post it on the WomenArts Facebook page or send us the link. We will feature the best ones in upcoming newsletters. Traditionally the SWAN Salute is done with one hand up for the Swan's head and one hand on your hip, but please feel free to create your own variations. Greer Reed, the founder of Reed Dance, is a native of Pittsburgh who started training early with the Pittsburgh Black Theater Dance Ensemble. She received further training at University of the Arts, Dance Theater of Harlem, and the Alvin Ailey Dance Theater School. 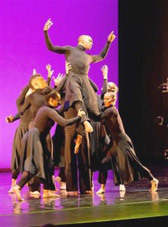 She danced professionally with the acclaimed Ailey II, and Dayton Contemporary Dance Company. 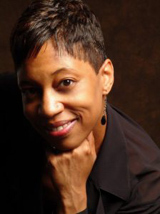 She is recognized as a master instructor of the Horton Technique of dance. Since her return to the Pittsburgh area, she has won many awards for her passion for her community and for mentoring young dancers. Reed Dance is committed to maintaining a world-class repertory, and to bringing the multicultural community together in a professional, educational environment, while preserving the African American experience.